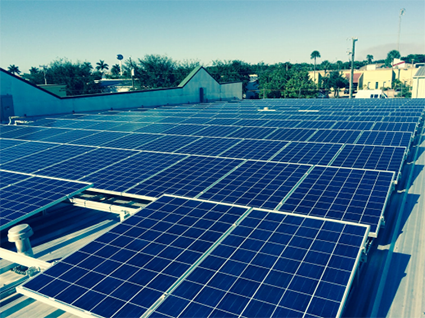 Fort Myers, FL: Synergy Networks is excited to announce that on January 16, 2014, The Synergy Data Center will be powered by renewable solar power and will achieve an 80% reduction in electric costs. The photovoltaic panels will produce 50kw of power. “We are extremely excited that we are one of only a handful of companies, including Apple, to be able to generate our data center power needs from the sun,” said Peter Seif, President of Synergy Networks. The Data Center, located in Fort Myers, houses Synergy Networks’ servers, routers, and fiber optic equipment. In addition, Synergy provides Colocation in their state of the art facility for companies that locate their equipment. Six redundant different fiber optic connections through Miami, Orlando, and Atlanta keep the equipment connected to the internet at all times. The solar project was coordinated by Kenneth Boyd, Vice President of Finance for Synergy. “The large investment made sense when you combine the electrical savings, FP&L rebates, and Federal tax credits” said Boyd. World Electric, a subsidiary on Sonepar and a worldwide electrical distributor, was instrumental in putting the project together, and also the supplier of all the materials needed to complete the project. Fred Skinner, Director of the "Energy Solutions Division" for World Electric, approached Synergy with the idea and brought in Sun Circuit Electric to install the photovoltaic panels, along with a very sophisticated micro-inverter system which allows for the monitoring of each and every panel individually. Synergy Networks has been an industry leader in delivering Internet solutions, designed exclusively for businesses, since 1999. As one of Florida's fastest-growing Internet service providers, Synergy Networks is dedicated to providing the highest-quality Broadband Internet access, web hosting, and design and internet marketing solutions. Synergy Networks offers a broad range of Internet and communication solutions designed to help businesses boost productivity, expand into new markets and maximize the benefits of the Internet. October 8, 2012 Fort Myers, FL: Synergy Networks is excited to announce a new cloud based backup solution for their business clients to store their data and important information. The backup, called Easy Online Backup, offers Military Grade Security, fast and continuous data backup, and is compliant with PCI, HIPAA, and other regulatory standards set to protect the privacy of individuals and consumers. “The backup solution fits perfectly with our product lineup of broad band data solutions,” said Peter Seif, President at Synergy Networks. New website offers interactive web design, online marketing and hosting solutions. Ft. Myers, FL (January 4, 2010) — Synergy Networks, Inc., a regionally based Broadband Internet service provider, announces it has created and launched a new email filtering product called Spamhammer. Ft. Myers, FL (September 26, 2007) — Synergy Networks, Inc., a regionally based Broadband Internet service provider, announces it has created and launched the official website for the I-75 Road Expansion (iROX) project which the Florida Department of Transportation will begin in October. Synergy networks will be responsible for maintaining and powering the site throughout the three-year construction process. In 2006, the company purchased a building at 10970 S. Cleveland Avenue (Page Field Plaza) from Keene Development, LLC. According to Synergy Networks company president Peter Seif, the company has moved in to the building, a one-story 5,000 square-foot facility that will now house the company’s entire Fort Myers-based operations. Synergy Networks' Data center is a state-of-the-art facility that enables companies to outsource the management and day-to-day operations of internet connectivity, web sites, servers, telecom facilities and equipment. Synergy Networks data center service provides direct access to one of Florida's most robust Internet infrastructures that is 100% Cisco powered with multiple redundant fiber routs, redundant air conditioning and power with a diesel generator and a 500-gallon fuel tank. Synergy Networks' data center is designed to ensure 24-hours-a-day, 7 days week network availability in an environmentally controlled facility. The new facility has also been built to meet all the new hurricane codes. Seif said the company plans to hire additional staff for their new Fort Myers’ headquarters. The company’s new address is 10970 S. Cleveland Avenue, Suite 406, Fort Myers, FL 33902. The company’s phone and fax numbers will remain the same. Ft. Myers, FL (June 16, 2006) — Synergy Networks, Inc., a regionally based Broadband Internet service provider, announces it has acquired privately held Gatortech and NetProduced.com, LLC of Sarasota, Florida. Seif added that both Gatortech’s and NetProduced.com’s Sarasota locations will remain operable. Gatortech’s former owner Zack Ghalayini will oversee daily operations. Synergy Networks plans to hire additional staff for their Fort Myers’ headquarters to support the operations in Sarasota. NetProduced.com LLC, is the leader in offering state-of-the-art websites for the real estate vertical market. NetProduced.com offers the real estate industry specialized hi-tech, feature-rich websites that brings technology to their trade. NetProduced.com offers Brokers’ sites as a Brokers’ intranet centralizing all documents, calendars, multiple agents’ sites as well as automatic uploads of agents’ listings from the Multiple Listing Service (MLS). NetProduced.com also offers agents sites for the individual agent affording them their own personal touch and feel but still one that has rich features to serve their clients. Synergy Networks is a leading broadband service provider headquartered in Fort Myers, Florida, with offices in Sarasota, Melbourne and Fort Lauderdale. The company combines its state-of-the-art facilities and nationwide network infrastructure powered by the industry’s best to provide business class Internet and data solutions to businesses throughout the State of Florida. Synergy Networks’ portfolio of solutions includes broadband Internet and data connectivity, Mobile Wireless connectivity, a full-range of web hosting and data center solutions, web design and integrated voice and data offerings in select markets. Ft. Myers, FL (September 2, 2005) — Whether you’re on the road or across town in a meeting, connecting to the Internet just got easier for businesses in Southwest Florida. Ft. Myers-based Synergy Networks, one of Florida's fastest-growing Internet Service Providers, has released its new Mobile Wireless Evolution Data Optimized (EV-DO) service for the Southwest Florida market place. Seif added that the service utilizes existing cellular towers which are then routed back through Synergy’s network out to the internet. Our EV-DO service increases the number of ways our customers can connect to the Internet and allows mobile and remote users to have access to their corporate infrastructure with broadband speeds through secure VPN’s. “The product is going to change how and where business is done by allowing anyone to stay connected from any location,” said Mike Early, vice president of sales for Synergy Networks. “From Realtors to doctors, any busy professional will benefit from the increased efficiency and productivity.” Synergy Networks will offer this service with unlimited access for $79.95 a month. Synergy Networks is a leading broadband service provider headquartered in Fort Myers, Florida, with offices in Sarasota, Melbourne and Fort Lauderdale. The company combines its state-of-the-art facilities and nationwide network infrastructure powered by the industry’s best to provide business class Internet and data solutions to businesses throughout the State of Florida. Synergy Networks’ portfolio of solutions includes broadband Internet and data connectivity, Mobil Wireless connectivity, a full-range of web hosting and data center solutions, web design and integrated voice and data offerings in select markets. "In the Internet, you can't guarantee quality of service, and your calls can have break-ups," says Peter Seif, president of Synergy Networks. "At the end of the day, that's the most important thing — you've got to be able to communicate clearly and phone calls can't be broken up." "The product is only as good as the underlying infrastructure, and in Southwest Florida, our infrastructure has been neglected for so long that it's going to take a while to catch up," says Steve Ward, president of T3 Communications. "A lot of companies are making decisions because they hear the hype associated with other marketplaces — but VoIP in Fort Myers or Naples is a lot different than VoIP in Miami or Tampa." "The management is just incredible," says Seif. "There are so many different applications — you can prioritize what numbers you want to come through, which ones to be sent to your voice mail, which ones to your cell phone. And you can manage it all online." "The biggest reasons that people are getting into VoIP are the man­ agement aspects and the reduction of costs between locations — if you have multiple locations and you call a lot, it makes a lot of sense," says Seif, adding that setting up such a system roughly costs $200,000 or more. "No one can hack into it — it's not across the public Internet," says Ward, adding that hosted systems can be more affordable for smaller businesses. "These new generation phone systems allow multiple facilities to act as one — you get the features and flexibility of a PBX system at the cost of about $100 per phone," says Ward. "It's not a lifeline," cautions Ward. "Don't count on it for that — you don't want to have loss of life because you dialed 911 and they couldn't dispatch to the proper place." 10.04.2004 - Waterman Broadcasting and Synergy Networks Deliver Record Online News Coverage of Florida Hurricanes to Thousands in Florida and Around the World. FT. MYERS, FL., - October 4, 2004 – Ft. Myers-based Synergy Networks, one of Florida's fastest-growing Internet Service Providers, announced that it supported serving the public interest during the summer of 2004 hurricanes while helping to deliver record-setting traffic of coverage produced by Waterman Broadcasting Corp. for Hurricanes Charley, Ivan, Frances and Jeanne. “Synergy Networks has been our reliable partner since 1999. They have consistently supported past increased viewer demand for our breaking news stories and severe weather coverage, especially during hurricane season. Yet it was not until this season, when for the first time in our state's history we were impacted by four hurricanes, that Synergy Networks helped us serve the public interest at absolutely incredible levels,” reports Keith Norman, Internet director for Ft. Myers-based Waterman Broadcasting. Waterman Broadcasting received hundreds of emails and letters from viewers expressing their appreciation for their online coverage, including one from this fellow broadcaster: "I had (NBC-2.com) up in our newsroom for several hours on Friday ( August 13- Charley hits SW Florida ), and was very impressed at the quality and you stayed up the whole time. I would love to know...what kind of equipment powers your back end"- Jason Crundwell, Kris Communications, Corpus Christi, TX. “Synergy Networks experienced technical team was constantly monitoring our ever-increasing traffic during our hurricane coverage. At times, they implemented additional hardware and auxiliary power to keep us up 100% of the time. Their superior service helped us deliver life-saving information to thousands of viewers during some of the most important news coverage in our history,” continued Keith Norman. With uninterrupted power and redundant network connectivity, customers utilizing Synergy Networks data center and Internet access maintained 100% up time during Hurricanes Charley, Ivan, Frances and Jeanne and their aftermath. "This Hurricane season has been unprecedented on its impact to the State of Florida; businesses still must have the peace of mind that the potential catastrophic consequences of storms like this will not affect their Internet and data services", said Chris Patrick, Vice President of Operations. "There is no margin of error of downtime in today's business world, and that is why customers like Waterman broadcasting depend on Synergy Networks to maintain their mission critical data and Internet systems 24 hours a day, seven days a week." Synergy Networks is a leading broadband service provider headquartered in Fort Myers, Florida, with offices in Sarasota, Melbourne and Fort Lauderdale. The company combines its state-of-the-art facilities and nationwide network infrastructure powered by the industry's best to provide business class Internet and data solutions to businesses throughout the state of Florida. Synergy Networks portfolio of solutions includes broadband Internet and data connectivity, a full range of web hosting and data center solutions, web design and integrated voice and data offerings in select markets. Synergy Networks is regionally based in Southwest Florida , with offices in Fort Myers , Fort Lauderdale, Melbourne and Sarasota . The company is a leading broadband service provider offering business-class Internet and data solutions to business throughout the sate of Florida . Synergy Networks provides Broadband Internet access, advanced data connectivity, web hosting, web design, and integrated voice and data solutions in select markets. NAPLES, FL (Nov. 6, 2001) - Synergy Networks, a regionally based Internet service provider, reports that Internet traffic has significantly increased since the September 11 terrorist attacks in New York and Washington. "With over 1,000 business customers, we have seen a 25 percent increase in e-mail messaging and bandwidth utilization since September 11," said Peter Seif, president of Synergy Networks "We expect that number to continue to increase as businesses rely more heavily on the Internet for basic communications." According to Seif, the significance of increased Internet traffic means businesses need to review their bandwidth capacity to handle the increase, as many of Synergy's clients have already done. "As a result of Sept. 11, we have doubled our backbone capacity directly benefiting our clients," he said. "Once again, the focus has turned back toward the Internet and changed the scope of business being done through the Net." Seif said hits to online news sites each day the week after Sept. 11 almost doubled compared to the week before the attacks. "Even local sites like NBC2.com and ABC7.com, whose servers we host, saw a 40% increase in their traffic," he said. " Luckily, they already had the bandwidth capacity to handle the increase and didn't experience any major problems like some national news agencies including CNN experienced." "As we learned of other news sites experiencing delays and access problems following Sept. 11, we were naturally concerned about our viewers and how our sites were operating," said Keith Norman, New Media Director for Waterman Broadcasting. "Needless to say, we were very glad we had been proactive and prepared for just such an event and didn't end up loosing viewers to another site because of access problems with ours." Seif added that Synergy Networks has further expanded their capacity by having a redundant fiber route built into their building. This will make Synergy one of a hand full of companies in South Florida with two separate redundant fiber routes. This second fiber route will be in place by December. Synergy Networks powers data center with solar power. Lee County Economic Development Office shot a series of videos of companies in Lee County and featured Synergy Networks. They are using these videos to provide info to new companies moving to Lee County. 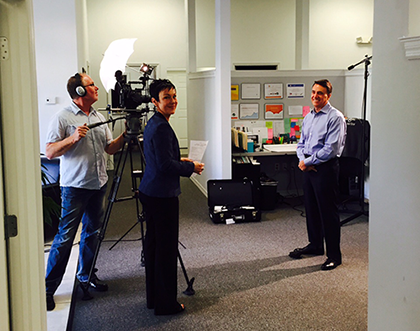 Here they are interviewing our CFO, Ken Boyd.